When a group of students from the Bald Eagle Area High School’s Mock Trial team walk into the Centre County Courthouse, there will be nerves. After all, junior member Luke Wilson said the atmosphere is intimidating, but one that can also lend itself to a plethora of learning opportunities. Mock Trial is exactly what its name suggests – a fake trial held by students who act as lawyers and witnesses in attempt to successfully defend or prosecute a case they have been assigned to. 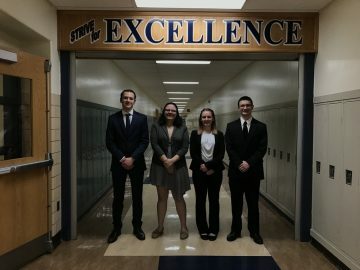 Wilson, along with classmates Peter Van Cise and Taylor Bumgarner will attempt to prove their client innocent in a scenario of alleged malpractice at their next competition.